A concrete example is warning systems for collision avoidance. Cars are fitted with more and more advanced equipment (i.e., radar and camera) for measuring distance to obstacles and other cars and are furnished with transponders for communication with the surroundings. All such signals together with map information, perhaps GPS receivers, and the motion of the car is used for evaluating the risk for collision and how it can be avoided. Clearly, both the information and the decision situation is complicated, but it is a good example of the the type of problems CADICS is working with. Other corresponding applications are, for example, to support autonomy in unmanned aircraft, to make correct medical diagnosis, and to supervise air traffic and complex industrial processes, etc. CADICS does basic research around questions of how information should be modeled, integrated, visualized and compiled to reach well supported decisions and actions. 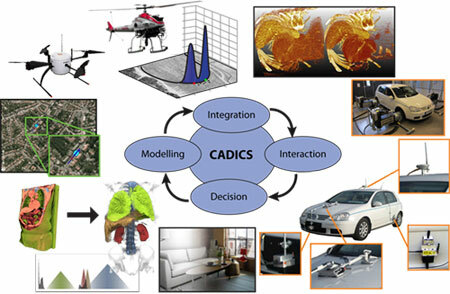 CADICS also works with applied research mainly connected to automotive, avionics and medical diagnosis.